When I wrote this recently rediscovered post, my husband and I were in the process of creating our "Chicago History in Song" program, which included my lyrics, "Song of Potawatomi", a version of which was included in the Forest Park Historical Society's "Des Plaines River Anthology." My high-schoolers have an unusual interest in the weather reports, especially if those reports include heavy rainfall. That’s because their school is just a half-block away from the Des Plaines River, a 150-mile strip of water that stretches from Kenosha to the Kankakee and meanders all through the near-west suburbs of Chicago. If the river gets too high, my kids get a day off. Even in good weather, and especially if we get stuck – as we regularly do – in Roosevelt Road’s early morning traffic, we always glance at the river as we drive by. Thick clumps of trees and bushes line its banks and grant a visual respite from bumpers and brake lights. I like to think that the river and its bank looked just like that when it provided life and transportation for the Potawatomi. They were the first Forest Parkers, the folks that traded in the downtown swamp but made their homes next to the Des Plaines River in an area which we also pass on our daily ride, a place currently occupied by many famous and infamous Chicago dead – the Forest Home Cemetery in Forest Park. The Potawatomi were friendly with the Europeans who moved into the Chicago area: they traded and intermarried with them, and even came to their rescue during the Dearborn Massacre and the Blackhawk Uprising. But the Great White Treaties were apparently made to be broken and the settlers quickly forgot the loyalties of the Potawatomi, kicked them off their own property and sent them packing, many to an area that later became Kansas. Except for a few sad stragglers, by the mid-19th century, the Potawatomi had virtually disappeared from the Chicago area. It’s a heartbreaking story and I always feel somewhat guilty when I get excited about what comes next: a city rising out of a swamp, like one of those rock gardens that grows to impressive heights when submerged in water. Actually, Chicago was submerged in water, but the rugged early city leaders didn’t let that stand in their way. With a “one, two, three” they lifted the city out of the muck. They reversed the natural flow of the Chicago River. And when the city burnt to the ground in 1871, it was rebuilt it in time to host the impressive Columbian Exposition of 1893. There has never been such a “can-do” city in all of history. Last Saturday morning, as I was turning east on to the Eisenhower expressway, with my son, heading towards the city, the Forest Park skies were dark and foreboding. But when we passed under the Austin ramp and the Chicago skyline came into view, I got quite a thrill. The clouds behind my favorite buildings were bright with sun and provided a stunning background to one of the world’s more impressive skylines. After I dropped my son off and headed back to Forest Park, the western skies were still gloomy. And nothing can change the fact that our Chicago predecessors of European descent forced some particularly noble and loyal Native Americans off their own lands. There was a way to build a city without laying a foundation of betrayal and heartbreak. But no one tried to find it. And John and I are going to do our best to make sure that the Potawatomi story is told. But we’d also like to tell the story of what came next: how sheer determination transformed a swamp into a city. A city with a stunning skyline. Our daughter's artistic tribute to the Potawaomi on the Circle bridge in Forest Park, part of the village's "cover our rust" art project. A snarky response to a humorous review. Or is it a humorous response to a snarky review? Authors are supposed to be above this sort of behavior but I couldn't resist. I just responded to an Amazon review, posted during the summer of 2017, for Women Heroes of World War One. "There were no woman heros (sic) in WWII. The title clearly announces that the book was written by a Cultural Marxist, who is incapble of writing proper English. There are thousands of books on the war worth reading, but his is not one of them." "Thank you so much for this interesting review. While I genuinely enjoyed it, I thought few comments might be in order. Number one. You commented on the wrong book. This one covers the First World War, not the second. Number two. I'm not a cultural Marxist. I'm not even a leftist. I'm right of center on many issues (left on others). My publishers, the ones who chose the title, are left of center. Yet our relationship is one of mutual respect and we never resort to bizarre name-calling. Number three. Perhaps you shouldn't judge a book by its cover. There are women from all aspects of the political spectrum featured in the WWII book (the one I think you were attempting to disparage): Corrie ten Boom was an Evangelical Christian who hid Jews in her home. Hannie Schaft shot collaborators and Germans for a Communist resistance organization. I respected them both for their work as did my publishers. Number four. You left the "e" out of "heroes" and the "t" out of "this." So your review needs one more "(sic)." I met Steve Schaefer in the early years of this decade because of our shared association with Pillars of Honor, a Chicago-based organization dedicated to giving a day of honor to World War II veterans too weak to take their Honor Flight. After my husband and I opened each program with World War II songs, Steve, the Pillars of Honor president, would give a few remarks, always introducing himself as a Vietnam veteran, the son of a World War II veteran. It didn’t take long to connect the dots: Steve’s service had been inspired by his dad’s. 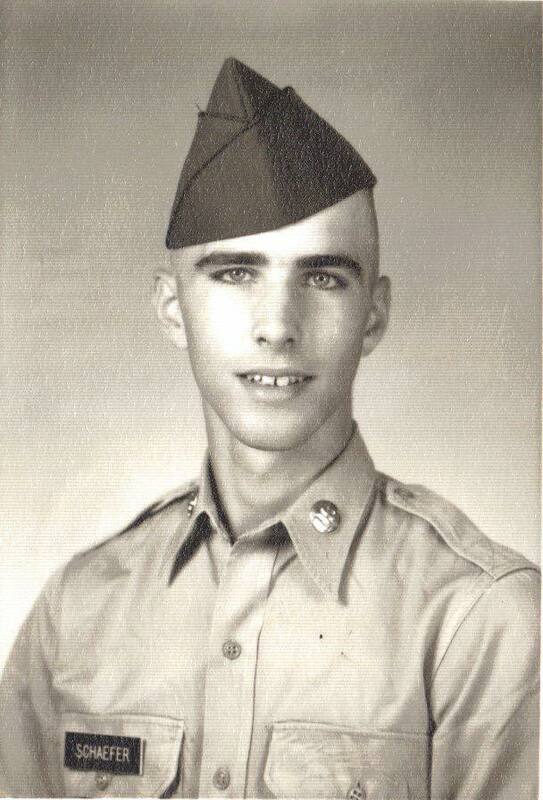 And the younger Schaefer was every inch the elder had been, serving three tours in Vietnam and earning four Purple Hearts. War has always produced heroes, a fact understood by young men of all time. Jurate Kazickas, a combat reporter who witnessed young Americans come under fire in Vietnam, wrote: “War, for all its brutality and horror, nevertheless offered men an opportunity like no other to be fearless and brave, to be selfless, to be a hero.” (1) Like Steve, many of the young men Kazickas met had been inspired by the heroism of the previous generation. Those fighting on the other side were infused with their own historical perspective. When the Viet Minh defeated the French at Dien Bien Phu in 1954, they were hailed as national heroes. So it was hardly surprising that the Viet Minh remaining in the south after the civil war began were quickly given a new name by their enemies: Viet Cong, short for Viet Nam Cong San, the Vietnamese Communists. Vietnamese soldiers working for the southern government would be hard pressed to fight with any enthusiasm against the Viet Minh, their own Greatest Generation. The war wounded these healers. Thuy was killed before it ended. Most of the American nurses survived but suffered decades of inner pain, which matched, or perhaps in some cases outstripped, the outward suffering of their broken, bleeding, dying patients, images that were often etched permanently in the nurses’ minds. After the war, the eerie silence between the two enemies once locked in mortal combat represented oceans of hurt; all attempts to move past the war seemed hollow when veterans on both sides were suffering. The southern Vietnamese soldiers were given absolutely nothing except, in many instances, a one-way ticket to a cruel reeducation camp. If they were fortunate enough to emerge alive, mere shadows of their former selves, they saw that the new government had obliterated all memorials to their dead comrades. Post-war life was also bitter for the victors. The rumored riches in the south had been exaggerated and the new country’s economy disastrously unable to provide for its people, much less its fighters. Many female veterans hoped that victory would bring an opportunity to raise a family in peace. But the long, grueling years of war left too many unable to bear children even if they could find someone amid the surviving males to marry them. Most American female veterans went on to live outwardly normal lives but they, like their male counterparts, received no recognition for many years. This was, perhaps Steve Schaefer’s biggest wound and one that should have earned him—and all the other vets—an additional Purple heart. The inability of family and friends to comprehend what they had experienced, on the one hand, and the lack of respect from strangers on the other, exacerbated the inner pain overwhelming these veterans. But perhaps the most inspiring stories of the Vietnam War occurred at this point. While post-traumatic stress is as old as combat, the suffering of Vietnam veterans gave it a name. A brotherhood of the war-wounded was formed and, as my book illustrates, a sisterhood as well. Lynda van Devanter founded the Women’s Project at the Vietnam Veteran’s of America. Kay Bauer, a US Navy nurse who was targeted by domestic terrorists after the war, created a PTSD program for female Vietnam veterans in Minneapolis, her hometown. And Diane Carlson Evans, who wrote my book’s forward, spearheaded the difficult ten-year project to honor all the women veterans of the war with their own memorial in Washington, D.C. 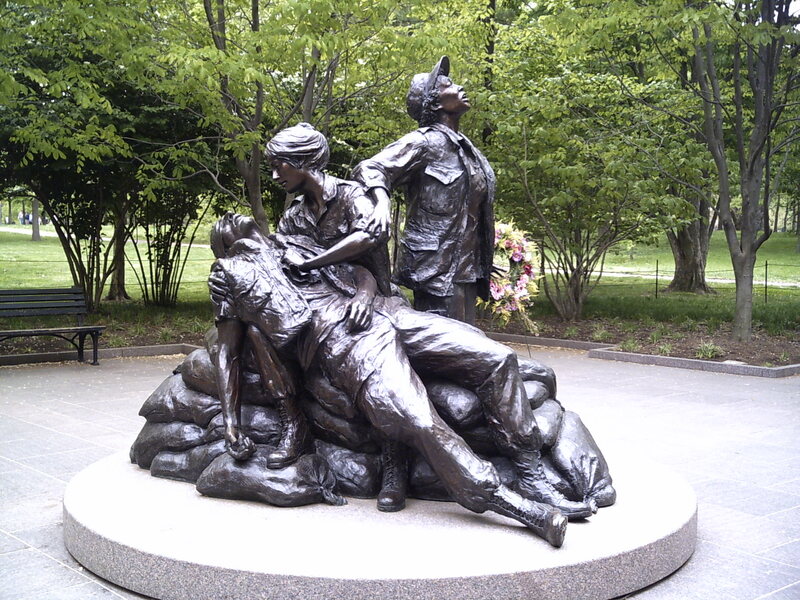 The unveiling of that memorial on November 11, 1993, was a time of honor, personal healing, and numerous reunions between female medics and their patients. Many Vietnam veterans, male and female, would eventually succumb to the effects of Agent Orange. Steve Schaefer was one of these. But like so many veterans of that war, Steve had found a way to move forward in his life long before it ended. He led local veteran’s associations and helped the homeless for decades, and in his final years worked tirelessly to give tribute to the generation that had inspired him. Courageous Women of the Vietnam War, 89. Courageous Women of the Vietnam War, 129. Courageous Women of the Vietnam War, 119. Courageous Women of the Vietnam War, 145. Bottom photos, left to right: Dang Thuy Tram, Bobbi Hovis, Lynda van Devanter, Kay Bauer. A diary, a memoir, and a war. Dang Thuy Tram is pictured on the far left, Lynda Van Devanter second from right. Because one of my goals in writing Courageous Women of the Vietnam War was to understand the conflict from multiple perspectives, I tried to feature women from different sides within each chronological segment. In the section labeled "Richard Nixon's 'Peace'", I included the story of Communist surgeon, Dang Thuy Tram, and American nurse, Lynda Van Devanter and found them to be movingly similar. In 1969 Dang Thuy Tram was a three-year graduate from medical school and Lynda van Devanter a newly trained nurse. These young women could have put their skills to use in relative safety but chose instead to serve their countries -- North Vietnam and the United States, respectively--by going into a war zone: South Vietnam. Thuy traveled down the dangerous Ho Chi Minh trail and landed in the Quang Ngai Province, an area with a history of intense resistance to foreigners. 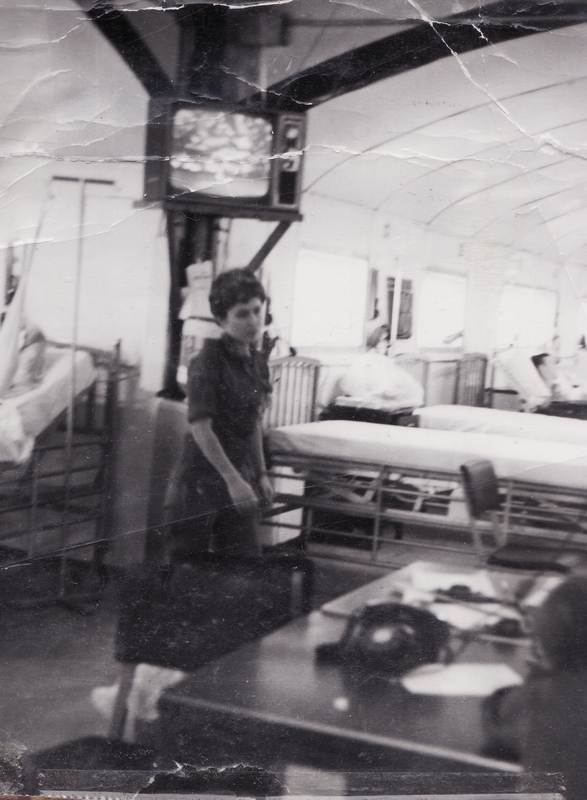 On June 9, 1969, just six months after Thuy recorded Ho’s speech in her diary, Lynda became one of those foreigners, working 244 miles away at the 71st Evacuation Hospital in Pleikuk. Thuy never wavered in support of her government’s war aims. While the war was absolute hell for most Vietnamese people, it wasn't hard for Ho Chi Minh's followers to keep their motivations stoked. The US, in their minds, was simply following China and France as the most recent colonizer and the southerners, they thought, were wealthy traitors. Each new Viet Cong or NVA death increased Thuy's hatred for the enemy and her desire for victory. The war had a devastating effect on the lives of both women. It ended Thuy’s--she was shot by an American bullet sometime in June, 1970. Lynda boarded her “freedom flight” that same month but returned home to face the hostility of strangers, the misunderstanding and indifference of friends and family, and years of untreated PTSD. But their stories were destined to have major post-war impact. When Lynda wrote her moving war memoir, Home Before Morning, in 1983, it became a bestseller, inspired the award-winning China Beach series, and illuminated the unique plight of American Vietnam War nurses. 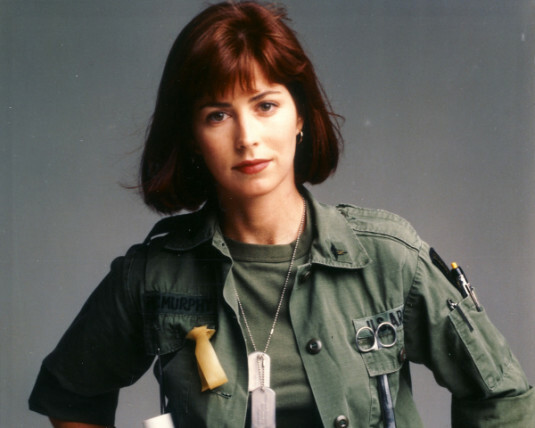 Dana Delany as US Army nurse Colleen McMurphy in the China Beach TV series. Thuy’s diary was found by an American military intelligence officer who took it home but brought it back to Vietnam in 2005 where it was published that year. There were plenty of war memoirs and biographies in Vietnam by this time, but Thuy’s diary revealed the voice of a flesh and blood human being who questioned her own motives, grieved for the lost, and hoped for an end to the war; she was not a hero carved in marble spouting all the correct sentiments. Last Night I Dreamed of Peace became a bestseller and was translated into English in 2007. War inflicts wounds not only on those who fight in them but on those who dedicate themselves to heal wounded warriors. Thuy and Lynda paid dearly for choosing the role of healers but they became the voices of their generations, and in speaking from their frame of reference, helped countless readers understand the war from the other side. 1. Courageous Women of the Vietnam War, 125. 2. Home Before Morning: The Story of an Army Nurse in Vietnam by Lynda van Devanter, 49. 6. Last Night I Dreamed of Peace: The Diary of Dang Thuy Tram, 99-100. Genevieve de Galard at Dien Bien Phu before the seige. While the basic concept of all my books is women in war situations, each title was born from a unique motivation. The impetus that brought Courageous Women of the Vietnam War into the world was my desire to (1) understand the complexities of that war’s timeline, and (2) to present stories of women who experienced the war from all sides within the book’s chronological framework. The first section covers the conflict that was the prelude to the Vietnam War--the First Indochina War—and it features a chapter on a Vietnamese revolutionary and a French Evacuation nurse. Xuan Phuong was born in 1929 and raised in what the French then called Annam, the central portion of French Indochina. Her family was wealthy as her father was the superintendent of a school, but she had uncles who influenced her with their revolutionary ideals. Genevieve de Galard was born in 1925 and was also influenced by her family: her uncles and late father had been career officers and her lineage could be traced back to Joan of Arc. She lived through the German occupation of France as a teen and joined the military in 1953 as an air evacuation nurse. These two women would find themselves on opposing sides of the First Indochina War, a conflict with its roots in World War II. The Viet Minh--the Viet Nam Doc Lap Dong Minh Hoi or League for the Independence of Vietnam--worked side by side with American OSS agents as they both fought the Japanese occupiers of Vietnam. On September 2, 1945, hours after the Japanese surrender to the Allies in Tokyo Bay, Ho Chi Minh, political leader of the Viet Minh, publicly declared Vietnam’s independence from France, quoting the American Declaration of Independence. Neither France or the United States would acknowledge Ho’s claim; France because it wanted to retake its colonies in an ironic attempt to regain some national dignity after four-plus years of German occupation, and the US because Ho was a Communist, the ideology of their new enemy. So instead of supporting Vietnam’s independence, they supported their former ally’s quest to retake their colony. Ho’s determination matched France’s and the First Indochina War began. In November, 1953, the French commander-in-chief in Indochina, General Henri Navarre, ordered a garrison in a northern village called Dien Bien Phu held in order to protect his pro-French Vietnamese allies in the area from the Viet Minh. The denouement of a conflict often boils down to a single battle and the First Indochina War ended here. General Navarre was as myopic as Viet Minh General Vo Nguyen Giap was astute and Viet Minh troops soon moved close enough to shoot down French planes, Navarre’s only planned means of resupply and evacuation. These women went on to live quietly productive post-war lives; they raised families, had careers, and are still with us today: I had the honor of communicating with both while writing this book. Three of my books features heroic WWII women so when I read of Fry's wartime work I immediately gave a hearty huzzah for her. Like so many other women of the time, she had placed her life on hold in order to do battle with Fascism. 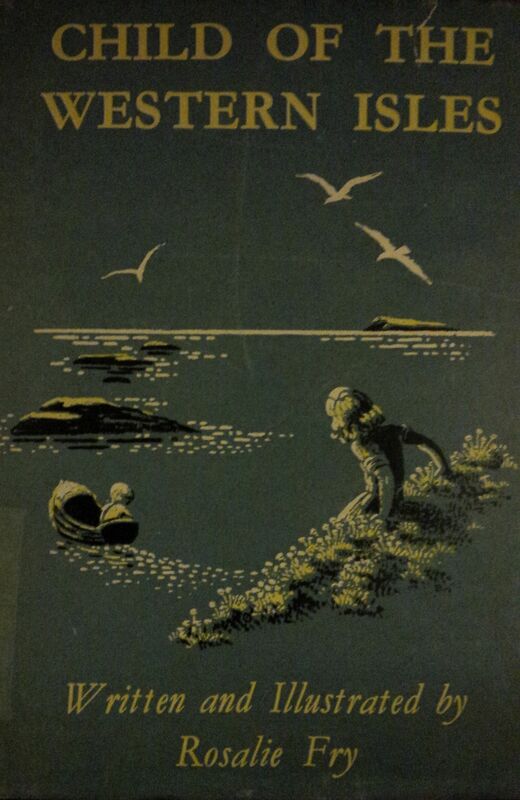 This is the Secret of Roan Inish story, originally known as The Secret of Ron Mor Skerry, but this Canadian version had a slightly different title. I was on cloud nine for about a year. I've reviewed several of Fry's books and one just arrived in the mail last week. I'd love to write a biography of her but until I find more material I will keep searching within the pages of her fiction for the person who set aside the creation of lovely worlds in order to decode for king and country. 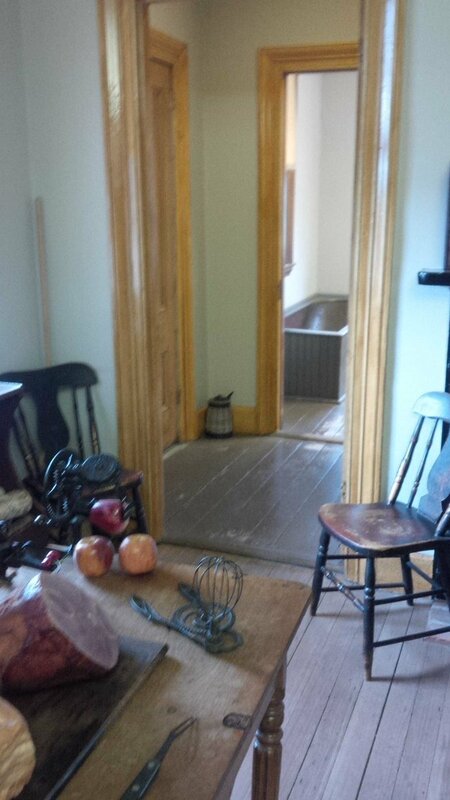 Ulysses S. Grant's bathtub (and the rest of his house). I’ve recently seen the Mississippi River. And Ulysses S. Grant’s bathtub. Both can be found in northwest Illinois in the lovely little city of Galena where I took my 20-something daughter. Our hotel view of the great river was so magnificent I eagerly set out to get a closer look. 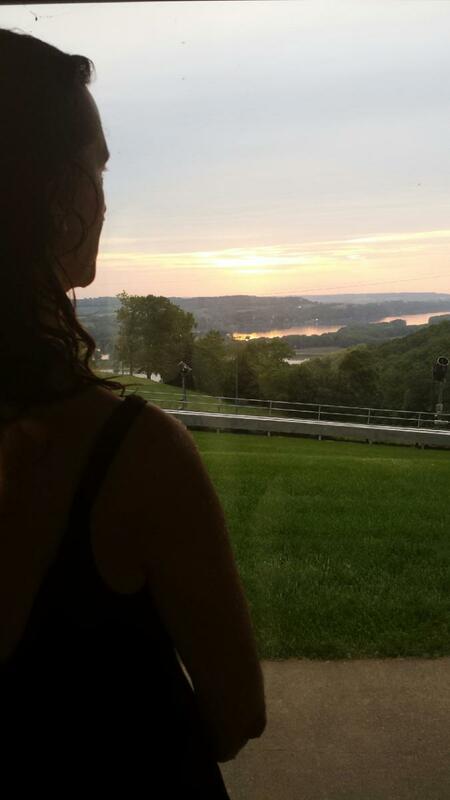 But as the bugs emanating from the nearby woods had complete disrespect for insect repellent I gave up quickly, like a city slicker, and contented myself with the beautiful vista from our room and the indoor pool. I did, however, get fairly close to that bathtub. The modest red-brick house that Grant had once called home was so small I was surprised when Frank, our tour guide, told us that it had been gift from the city of Galena to the conquering Civil War hero. Perhaps it was the best this modest city could do for its most famous son. Frank showed us the library first. Two of the four walls were covered by glass-encased bookshelves. 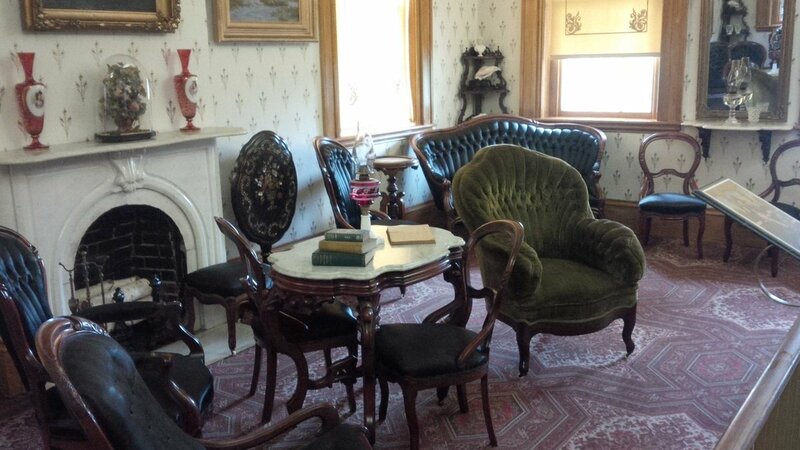 Many of the books here—and most of the home’s furniture for that matter--had personally belonged to the Grants. Readers often become writers and here was the personal library of the future memoirist whose writing was so good his book has never gone out of print. Any reading would have been done at the round table in the center of the room upon which sat a 15-pound Bible. Perhaps the room did not reek of comfort, but it most likely smelled of cigar smoke while the Grants lived there: an elaborate waist-high ashtray stood between the window and the table. The parlor was next. The seats were low to the ground, Frank said, simply because people were shorter back then. All but one of the chairs was black, covered with a woven combination of horse hair and silk, highly durable but apparently uncomfortable. Notably, Grant’s favorite chair, covered with plush green cloth, stuck out like a sore thumb in that room of slightly scary upholstery. Grant was a soldier, first and last, but he obviously enjoyed comfort when and where he could find it. 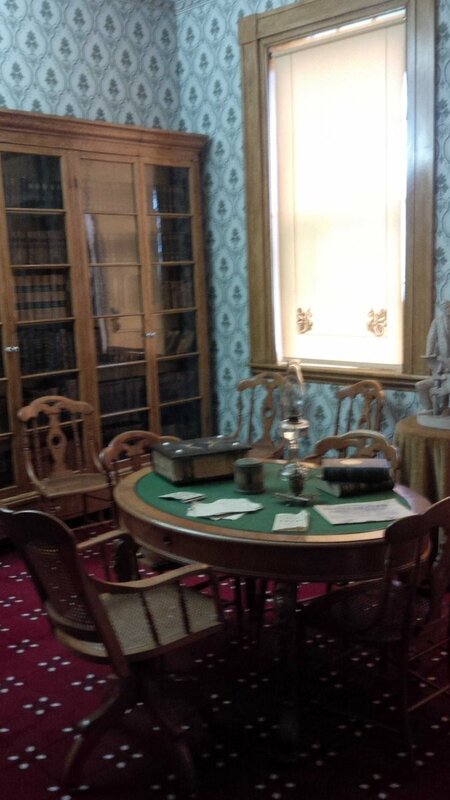 Grant and his wife, Julia, had received crowds of people in this smallish room and I wondered how. Perhaps their Lilliputian stature came into play or maybe they had an affinity for claustrophobic social gatherings. After leaving the small dining room—the table set with the Grants’ own china—Frank sent us off to tour the bedrooms upstairs on our own. 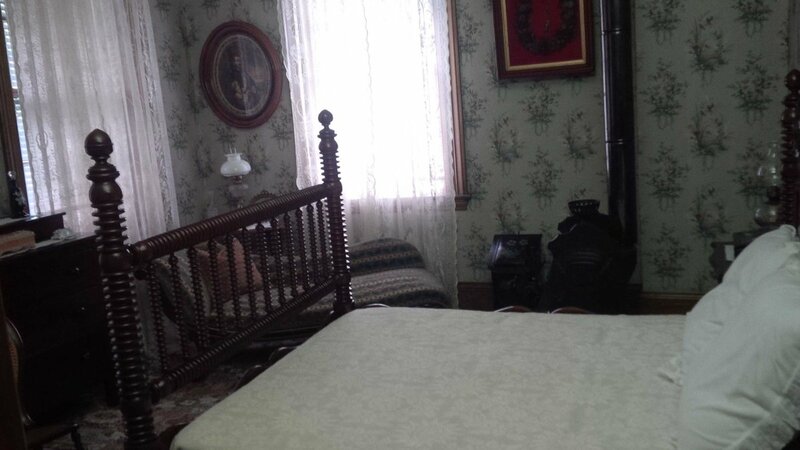 Each of Grant’s four children had their own room, complete with a chamber pot. Who emptied them out, I wondered? The Grants themselves or perhaps their “help.” In the next room, the kitchen, we learned that while the Grants did hire servants, these folks lived elsewhere. Seriously, where would they have put any live-in “help”? Behind the kitchen was a bathtub, the view of which could be accessed by leaning over the railing in front of the kitchen. 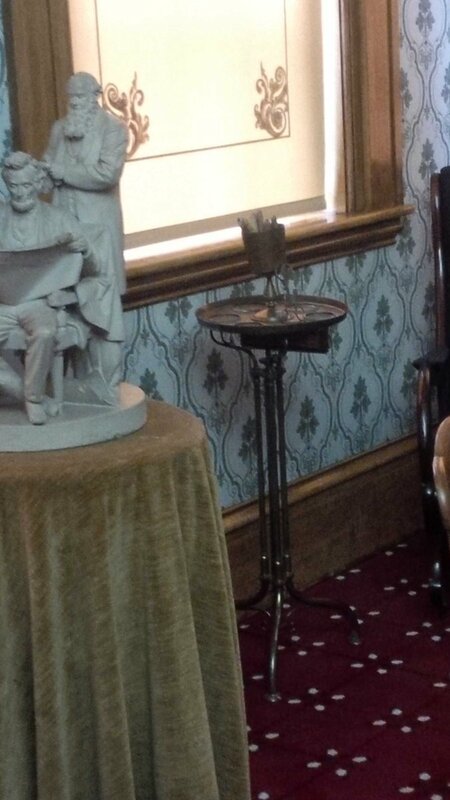 “How often do you get to see where a former president took a bath?” Frank quipped. Not often. We all leaned over and took a look. The entire family bathed in this tub and in the same water, beginning with the eldest, a custom not peculiar to the Grant family. Still, eewww. The house was simple, straightforward, and seemed a perfect fit for the man who had once lived here, someone with little success in civilian life but who was such a natural-born military leader that he became a major force in winning the Civil War for the Union. 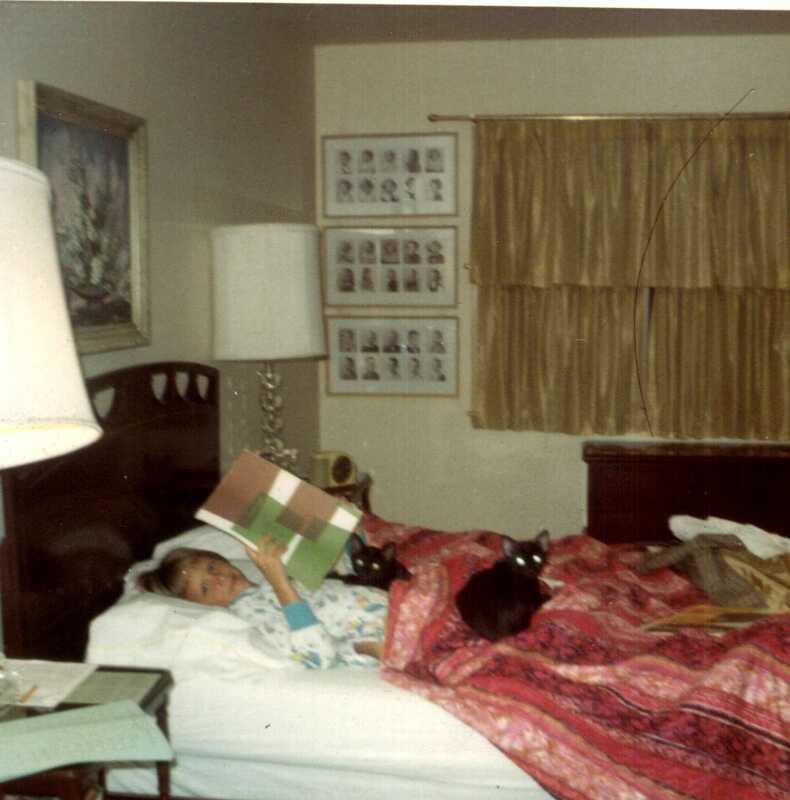 The author reading from Highlights in her parent's bedroom. I recently discarded an entire library. While there are still books in every other room in my house, those in the basement had been there since the early 2000s when I started a collection of non-fiction for my kids after my local library did a massive shelf cleaning. Maternal instinct found dangerous companionship with my inability to walk away from a free book and the basement shelves were soon filled with a treasury of vintage books about animals, historical figures, science projects, art history, and jokes. They were never read. My kids have never been fans of non-fiction which I’ve always found puzzling. Although I grew up on the Oz series, Dr. Seuss, Babar, Laura Ingalls Wilder, and Aslan & the Pevensies, I was also a voracious consumer of non-fiction. I believe my lasting interest in the genre was born on a long Sunday afternoon during an encounter with a biographical series I discovered in the room of my older brother. The Clara Barton story in the collection might have been fictionalized, now that I think about it, but reading a book about an actual person was, for me, a revelation. My thirst for knowledge of the real never altered so I suppose it makes perfect sense that when time came for me to write my own book, it was non-fiction, the first in the Chicago Review Press’s women’s history series, “Women of Action.” I’ve written five books for the series and was recently down in the basement, cleaning, because I’d just turned in my final contribution; I always crave physical, organization work after meeting a book deadline and, ironically, I turned from one non-fiction project to another. As I sorted through the basement library, I found it a little sad to think that these books, while read by some children at some point in time, were never read by my own. But as they are all avid bibliophiles (and some aspiring writers), I have no cause for complaint. I’ve thrown away the moldier-smelling titles, donated others to my local little libraries (someone will surely value them! ), and will use the rest in book-related crafts—I still have a long way to go before my brain feels balanced and I stop craving physical work. I’m not sure what my next contract will look like but surely there are other books about the real world to be written, histories and biographies that will inspire younger readers. Perhaps these books will one day find themselves in a neglected basement library, but I hope not before being responsible for causing a few readers, at least, to understand that non-fiction can sometimes be stranger—or at least just as fascinating—as fiction. "The Vietnam War was hardly an all-male event. There were women participating on all sides of this war. Kathryn Atwood has collected the personal stories of a good sample of the women involved and her book is well worth reading for a look at the untold stories of the war." 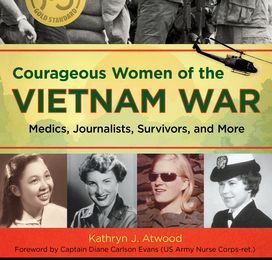 "It is with a heart full of gratitude that I offer my thanks to Kathryn Atwood for bringing to light these women’s stories from the Vietnam War in her book Courageous Women of the Vietnam War: Medics, Journalists, Survivors, and More (Women of Action). Remembering their courage and resilience in the face of war remains of utmost importance." 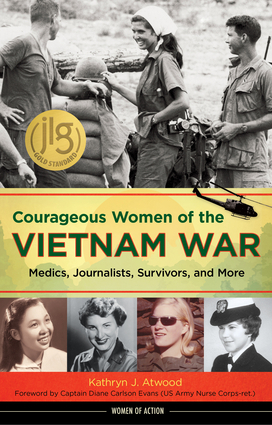 "A moving tribute to the brave and often unacknowledged contribution of women during the Vietnam War, from nurses to surgeons, guerilla fighters to peace activists, journalists to survivors. Atwood honors heroines from all sides of the conflict, highlighting the common courage and humanity of the the women who struggled for survival and compassion in the midst of war. 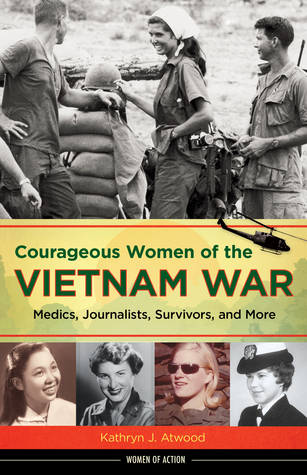 Courageous Women of the Vietnam War is an inspiration!" Wonder Woman is a stunning film. And apart from the first Captain America, its plot was one of the few in the super hero genre that I could actually follow, perhaps because the story line wasn’t convoluted and perhaps because I was already familiar with many aspects of the film’s setting. I was enormously impressed by how many things the film got right about that setting including one element of World War I of which we Americans seem to know little: the German occupation of Belgium. The film might have been just as successful had it focused solely on military elements, had Diana, Princess of Themyscira, charged through no-man’s-land merely to defeat the enemy at hand. But she deflected German bullets during that spectacular scene for a very specific reason: she was determined to rescue oppressed Belgian civilians. For despite her stunning good looks, what made Diana truly beautiful was her empathy: her heart for the downtrodden, the wounded, the helpless. While her strength and indestructible weapons gave her super-human abilities, her heart put me in mind of two real women who also took it upon themselves to help Belgian civilians during World War I.
Mary also visited the Belgian army’s front-line trenches where at one point she was close enough to the German line to distinguish individual sand bags. But what she considered the tour-de-force of her trip was an hour-long interview of King Albert who Mary described as “a very big…blond young man, very patient, very worn.” (2) She initiated the visit because she wanted to confirm the rumored reports of German atrocities against Belgian civilians during the invasion and occupation. Mary turned the interview into a report and her notes into a book called Kings, Queens and Pawns: An American Woman at the Front, hoping that her pen and fame might save the Belgian people by way of budging American neutrality. It did nothing of the sort; the United States wouldn’t enter the war until 1917 and for very different reasons. But Mary, like Diana, was an empathetic outsider. Gabriel Petit, on the other hand, was a Belgian. Born into a broken, blighted home, Gabriel was on her own at the age of 15 and at 20 survived a suicide attempt. However, just before the German invasion in August, 1914, her life was starting an upward turn; she was taken under the kind wings of an elderly couple in Brussels and became engaged to a Belgian soldier. But when Brussels was overcome and occupied, Gabriel left Belgium to find her fiancé who had escaped to France with his regiment. During this trip, Gabrielle discovered a vocation far more powerful than fundraising: she was recruited by a British Intelligence officer. After two weeks training in London, she returned to Belgium as a spy. Unlike Wonder Woman, Mary Roberts Rinehart and Gabriel Petit did not possess indestructible weapons and super-human strength. But like the inspiring heroine of the recent film, they both had great hearts and courageous compassion which propelled them to do everything in their power to make a difference in the lives of the oppressed Belgian civilians of World War I. 1. Kings, Queens and Pawns: An American Woman at the Front, 49. 2. Women Heroes of World War I: 16 Remarkable Resisters, Soldiers, Spies, and Medics, 193. 3. Women Heroes of World War I: 16 Remarkable Resisters, Soldiers, Spies, and Medics, 193. 4. Women Heroes of World War I: 16 Remarkable Resisters, Soldiers, Spies, and Medics, 55. 5. Women Heroes of World War I: 16 Remarkable Resisters, Soldiers, Spies, and Medics, 58. Back in 2010, I told an acquaintance that I had just finished a WWII collective biography, due out the following year. She immediately began enthusing about a WWII book she’d been reading and asked if I'd also read it. I hadn’t and the way she described it—a WWII flyboy who becomes lost at sea before being nearly tortured to death in a Japanese POW camp—didn’t particularly pique my interest. My personal images and interest in WWII—as well as the book I was working on--all focused on the European conflict. My Army Air Corps dad and his three brothers had all flown in the European Theater and while I was in high school The Hiding Place: The Triumphant True Story of Corrie Ten Boom had come to theaters. So the two basic images implanted in my mind regarding WWII—tall, dashing, Dutch-American flyboys and a middle-aged Dutch woman who defied the Nazis by hiding Jews—had, apart from Pearl Harbor, made me consider WWII as a primarily European conflict and had compartmentalized the war in my brain under the category of courage, not necessarily endurance. Louie Zamperini, on the other hand, the subject of my friend’s favorite read, had gained hero status in the Pacific Theater by what he’d endured: a sadistic Japanese officer named named Mutsuhiro Wantabe became determined to break him. Zamperini shouldn’t have survived. He did. When I decided to write a book focusing on the Pacific War, reading Unbroken: A World War II Story of Survival, Resilience, and Redemption became one way in which I immersed myself in the general topic. Like so many others before me, I was mesmerized by the tale and Laura Hillenbrand’s masterful storytelling. And in the process of reading the book, along with the memoirs and biographies of the women featured in what would become Women Heroes of World War II—the Pacific Theater: 15 Stories of Resistance, Rescue, Sabotage, and Survival, I came to understand that endurance was precisely what the Pacific War had been for millions of people; not only for American troops fighting an enemy who refused to surrender, but for the civilians unfortunate enough to find themselves in Japanese-controlled territory. Trying to implement their “Asia for Asians” mantra, the Japanese invaders/occupiers rounded up all Allied civilians into camps. While a far cry from the Nazi-run concentration camps, these Japanese internment camps were full of disease, starvation, and yes, endurance. One fascinating way in which a group of imprisoned British and European civilians and Australian army nurses sought to maintain the health of their spirits was by something called the vocal orchestra. A choir-without-words initiated by two brilliant musically-inclined inmates who created a repertoire of orchestral pieces such as the Largo from Dvorak’s New World Symphony, the vocal orchestra was a brilliant antidote to the despair pervading the diseased camp. Humans needs food and medicine as well as encouragement, especially when living in a tropical environment, and because the prisoners had little of either, the vocal orchestra literally died out long before the war’s end. But its impact was beautifully captured in the memoir of Helen Colijn, a Dutch teen featured in Women Heroes of World War II—the Pacific Theater: 15 Stories of Resistance, Rescue, Sabotage, and Survival. Three women featured in my book perhaps fit more precisely into the Unbroken: A World War II Story of Survival, Resilience, and Redemption category because they, like Zamperini, endured intentional physical torture. Elizabeth Choy, Sybil Kathigasu, and Claire Phillips all suffered at the hands of the Kempetai, the Japanese military police, who, like the German Gestapo, were tasked with weeding out resistance activities. Elizabeth Choy found herself in their hands inadvertently after she had unknowingly passed radio parts to Allied prisoners in Singapore. The Japanese were convinced she was part of a larger plot so to obtain the desired confession, they tortured her nearly to death. Deeply religious, she refused to lie, even to save her life. Sybil Kathigasu, on the other hand, was an active member of the Malayan resistance: she provided medical care to local guerilla fighters. She was caught and taken into Kempeitai custody where one officer named Eko Yoshimura took a special interest in breaking her. He nearly destroyed Kathigasu's body but her will remained intact and she never divulged the information Yoshimura sought. 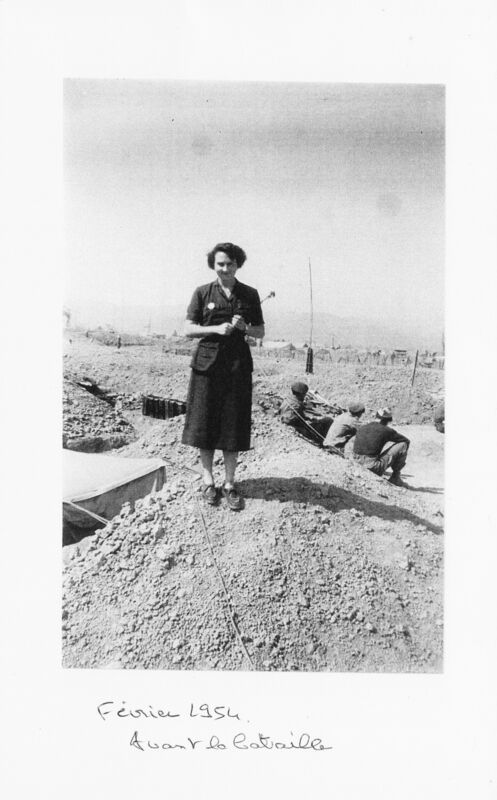 Claire Phillips, an American member of the Manila resistance, charmed and chatted up Japanese officers in her nightclub, gleaning precious tidbits of intel, then used her earnings to sneak food to starving American POWs. She was caught, interrogated, tortured, and starved by the Kempeitai for nearly nine months without betraying anyone. There was often a long-term cost for defying Imperial Japan. When I finished Unbroken: A World War II Story of Survival, Resilience, and Redemption, I realized that the book’s title was a bit of a misnomer. Yes, Zamperini survived Wantabe’s beatings. But years after the war, the brutal Japanese officer was still in his head, tormenting his dreams so much that the American hero, now a full-fledged alcoholic, was convinced that the only way to peace was an airplane ticket to Japan so he could kill Wantabe. Conversion to Christianity saved Zamperini from his dark spiral but not all American Pacific War POWs fared as well: they suffered far more PTS, alcoholism, premature death, suicide, and divorce in comparison with their counterparts released from German camps. I found a similar trend among the women whose stories I encountered while writing my book. Sybil Kathigasu died three years after the war from complications arising from her beatings and Claire Phillips died in 1960 from alcoholism-related meningitis. Even women who hadn't been imprisoned during the war were powerfully and negatively impacted by it. Yay Panlilio, part of an anti-Japanese Filipino guerilla force, claimed post-war that the conflict had completely worn down her body, mind, and emotions. Gladys Aylward's health remained precarious for years after she'd personally escorted Chinese war orphans to safety during a long, dangerous trek. Minnie Vautrin, an American who exhausted herself trying to protect women during the horrific Nanking Massacre, eventually committed suicide. All war creates suffering in the moment and in the aftermath. This was especially true for the Pacific Theater, which is why America's general lack of familiarity with the conflict's details is so tragic. After all, the victims of Japanese fascism--or those who became heroes defying it--deserve respect and remembrance just as much as their counterparts in the European Theater. Video on SOE special agent Pearl Witherington, narrated by me. I had the opportunity this week to come face-to-face with a slice of my target audience: teenagers. 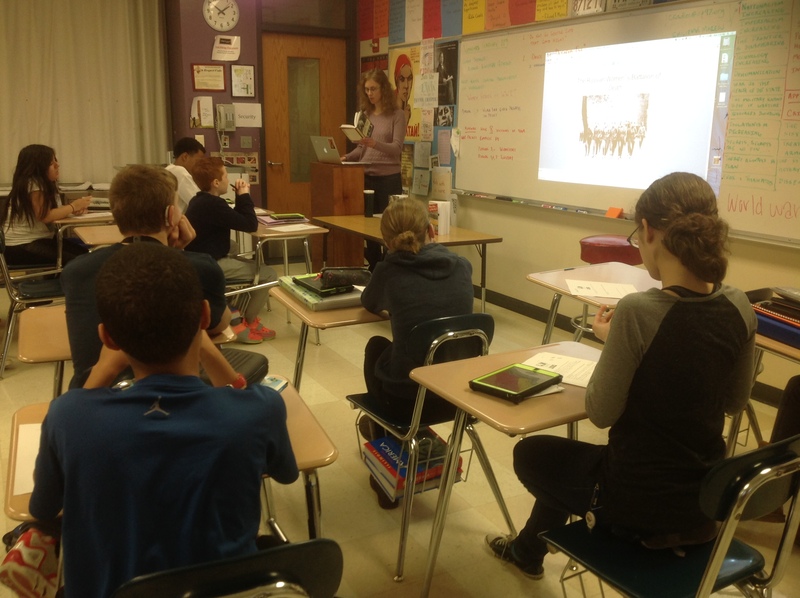 They heard the heroic story of French teen Emilienne Moreau before viewing a sizeable number of archival photos depicting German, French, British, Italian, and American women at work on the home front, in munitions factories, in the medical services, and in auxiliary military roles. They also learned the surprising connection between the Russian Women's Battalion of Death and American suffragists: how the existence of the world-famous Russian battalion refuted the American "Bullets for Ballots" anti-suffragist slogan. and on the same topic -- "...it was amazing how brave and selfless she was." - "What I found most interesting was how so many women helped out in the war, whether it was being a nurse or a factory worker or a number of other things." - "I liked when she listed all the things women did when the men were at war because I found it interesting to learn about what they did back then." 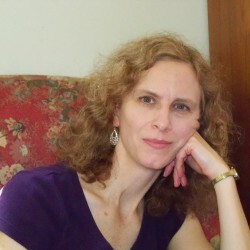 - "Emilienne Moreau and her story was inspiring and very interesting and courageous." - "How all of the women were somehow connected. Some women joined [WWII] because they were inspired by [WWI] women, or they read memoirs, and were motivated." - "Feminine power even though they couldn't vote yet." - "The amount of jobs that opened up - especially that women participated in the Army and Navy, and some [in the US Navy] got paid as much as men. This is very surprising because women didn't work as much, it was less common, so the fact that they got equal pay is surprising. Even today we have issues with gender equality and pay." - "I found all of the stories in the war effort very interesting because that is something we don't see in our textbooks. We only read about male heroes in World War I, but women played a big role." Seventy years ago this past June the armies of the Allies landed on the beaches of Normandy to put an end to what had begun, in a sense, 30 Junes earlier on the streets of Sarajevo when Franz Ferdinand lost his life to an assassin's bullet. The connections between the two world wars are myriad but one that most Americans never consider is this: both conflicts were fought with courage if not heroism. 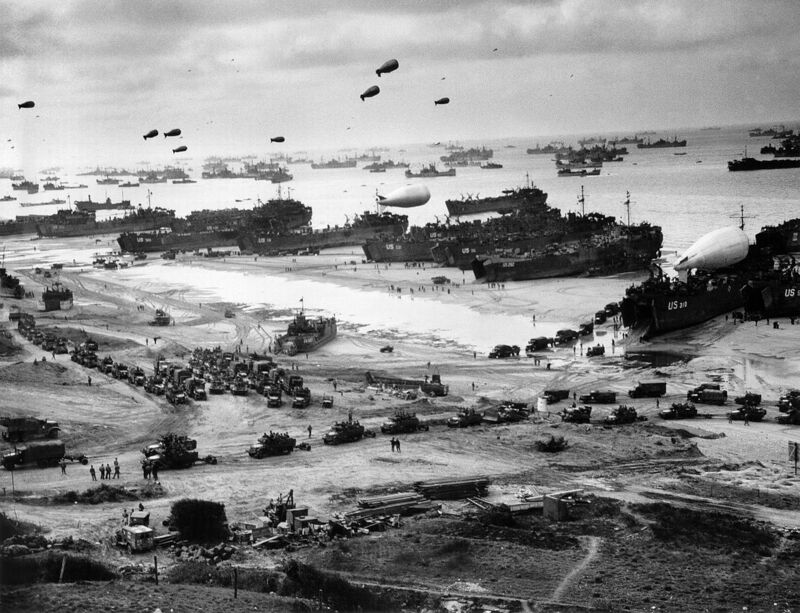 Americans make an immediate association between the concept of hero and the Second World War thanks, in part, to a continuous stream of related television and film productions featuring our Greatest Generation. But the First World War? Most of us know too little about it to make that connection. And heroism requires a cause. World War II clearly had it. World War I did not, at least initially. The nationalism and related territorial claims that stirred Europe to war in 1914 hardly constituted a good vs. evil situation. However, something occurred early on to give the war something of that sense. On August 3, 1914, the German government requested a peaceful passage through Belgium into France. Germany's army was large and battle-ready. Belgium's was neither. Yet the Belgians refused and defended their border. The surprised Germans reacted, in some instances, with savagery. Belgium, eventually beaten and occupied became internationally known as "Brave Little Belgium." The Germans were called "The Huns." As in Attila the. Clearly, not all German fighting men were barbarians. And the armies of the Central Powers certainly showed courage in battle; one only has to consider their enormous casualty numbers to appreciate this. Yet their cause, associated as it was with Germany's, would never seem to be as fully right to Americans as that of the Allies, who the United States finally joined in 1917. Hoping to make a clear distinction between American and European military motivations, U.S. President Woodrow Wilson stated the United States would join the war to "make the world safe for democracy." And if the United States had an all-American reason for going to war, their involvement in the European conflict produced an exceptional all-American hero. Alvin York, born and raised in Tennessee, was an expert marksman who gained fame -- and a significant number of medals -- during one stunning incident on the Western Front: while a group of machine-gunning Germans was decimating his battalion, York single-handedly sniped off more than 20 before the rest surrendered. He then escorted 132 German prisoners to Allied headquarters. An entire generation of American boys, inspired by York's heroics, took up his mantle when they came of age and fought Fascism from Normandy to Iwo Jima. But there were other World War I mantles, European ones, that affected World War II Americans. During the Second World War young Belgian Andrée de Jongh created and operated an escape route that rescued hundreds of downed American (and British) airmen from occupied Europe. Her inspiration to fight Nazi Germany? Edith Cavell and Gabrielle Petit, two World War I heroines executed by the Germans in Brussels, de Jongh's hometown. 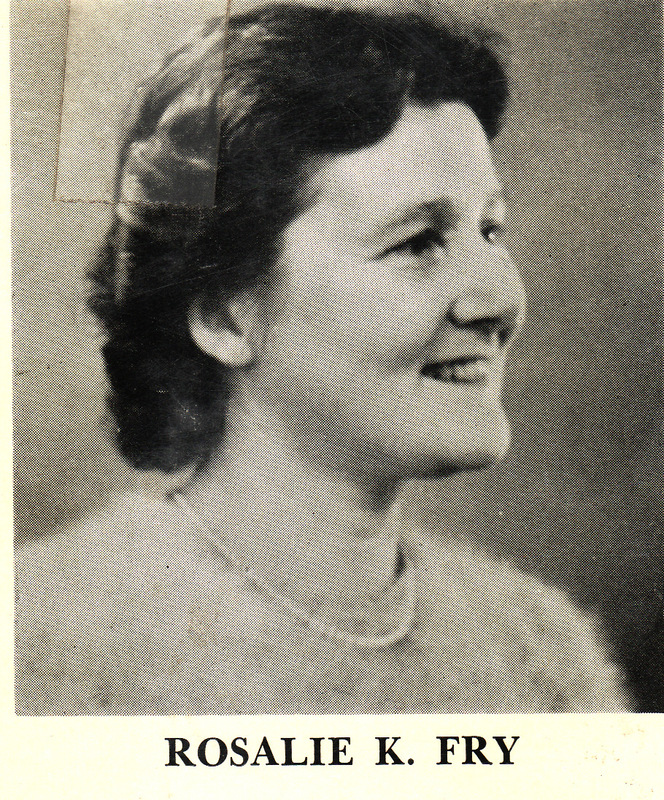 British WWII agent Pearl Witherington saved countless American lives after D-Day when her resistance network in Central France disrupted German communication and transportation, significantly slowing sections of the German rush to the Normandy coast. Part of Witherington's inspiration for becoming involved in resistance work had come from reading a biography of French World War I heroine Louise de Bettignies who had run a brilliantly successful espionage network for British Intelligence in German-occupied France. World War I might seem morally ambiguous from a distance but this does not mean that we should underappreciate the dedication and courage of its participants. If the war wasn't overflowing with heroic principles, it did create exceptional heroes, some of whom would directly impact the next generation, men and women whose war would be painted in much clearer moral shades.